Jurassic World: Fallen Kingdom , 2018. Starring Chris Pratt, Bryce Dallas Howard, Rafe Spall, James Cromwell, Justice Smith, Toby Jones, BD Wong, Ted Wheatley, and Jeff Goldblum. Four years have passed since the Jurassic World theme park was closed, but now a volcano on Isla Nublar has become active and it’s threatening to wipe out the remaining dinosaurs. Owen Grady and Claire Dearing are re-united in an effort to save the creatures but find themselves in the middle of a conspiracy that could threaten the entire planet. Twenty-five years after Steven Spielberg shocked the world by reintroducing dinosaurs to our lives and inspiring millions of people to dream of becoming palaeontologist – before having those dreams shattered by the sight of a velociraptor in a kitchen – director J.A. Bayona finally leaves the island towards an uncertain but exciting future. Oh, and apparently raptors can cry, so there’s that. Jurassic World: Fallen Kingdom echoes both the original Jurassic Park and its first sequel, The Lost World throughout its 128-minutes runtime; there are references to everything from the opening scene of the first film, to the famous kitchen scene, to the mirror, to the general plot of the second film. 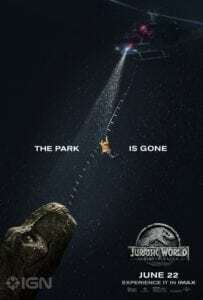 Three years after the events of Jurassic World, the world doesn’t care that much about dinosaurs, and Isla Nublar has been abandoned yet again to run its natural course. Except now there’s a volcano threatening to destroy all the dinosaurs on the island (apparently all the dinosaurs from Isla Sorna, or site B, were conveniently taken to the park at some point). There are some interesting questions raised in Fallen Kingdom about animal rights and genetical engineering, as the US government debates helping save the dinosaurs or let them become extinct once more. 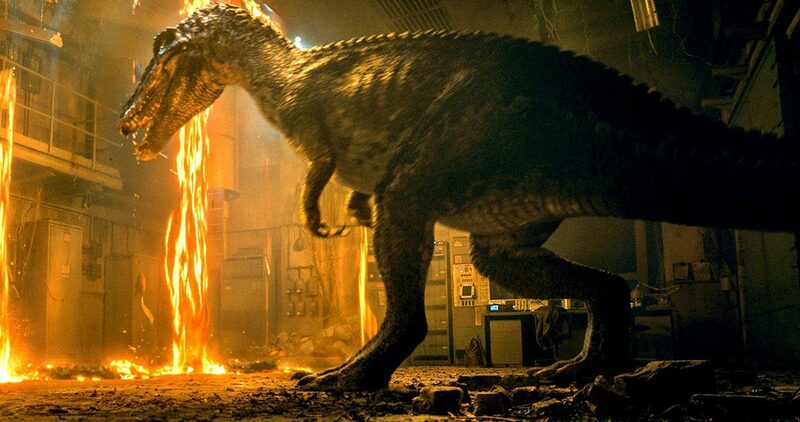 Everyone’s favourite hell-wearing marathon-runner Claire Dearing (Bryce Dallas Howard) and Chris Pratt-type Owen Grady (Chris Pratt) get hired by someone with very close ties to John Hammond and the original park, the criminally underused James Cromwell as Benjamin Lockwood, to go back to the park and same as many dinosaurs as they can. We also have two new and very unnecessary additions to the cast in this film. Daniella Pineda plays dinosaur rights activist Zia Rodriguez, and Justice Smith plays Franklin, an IT guy so boring and unnecessary he doesn’t even get a last name. They are meant to replace Jake Johnson’s and Lauren Lapkus’ characters from Jurassic World as comic reliefs, but Smith doesn’t get much to do and he looks like he didn’t want to be there in the first place. Sadly, they are not the only unnecessary characters, as Jeff Goldblum is criminally wasted in just one 3-minute scene split in two that we already saw in the trailers. The most interesting part of Fallen Kingdom is without a doubt director J.A. Bayona. From the moment he was hired to direct and started teasing the return of horror to this franchise and how gothic horror would play a huge part of the film, I was cautiously optimistic. Thankfully, the Spanish director known for The Impossible and The Orphanage shows he’s more than capable of handling big CGI spectacle and intimate, claustrophobic horror. The first part of the film feels like a huge disaster film with very high stakes and Bayona is more than up to the task of placing us right in the middle of the action, with massive set piece after set piece that makes the movie move with a quick pace that doesn’t give you a break before the next big thing comes at you. The island sequence will also be responsible for making kids around the world cry for a bunch of killer dinosaurs in a way unseen since Littlefoot’s mother dies in The Land Before Time (Spielberg must really hate dinosaurs). We even see Blue the raptor shed a tear. I repeat. A raptor can cry. After we leave the island, probably for the last time, the film does a 180 spin in tone and becomes a gothic horror tale set at Lockwood manor. Here Bayona flexes his horror muscles and gives us the claustrophobic horror film with dinosaurs we have been craving since the tall grass scene in The Lost World. 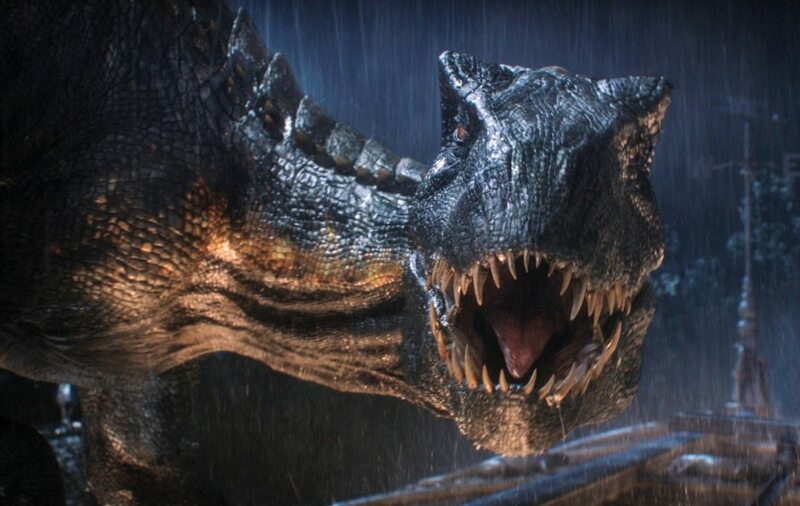 Those worried that Fallen Kingdom would overuse CGI like its predecessor should not worry, as there is a surprising amount of practical effects and close ups that bring you closer to all the dinosaur action and emotions, that manage to make you love them even more before they scare the hell out of you. Michael Giacchino continues to prove he’s one of the best composers working today, combining the familiar tunes from John William’s classic score while giving us some new and memorable sounds. Despite some incredibly cliché and stupid villains, the manor set provides with enough scares and thrills to satisfy those wanting a return to the scarier roots of the franchise. Jurassic World: Fallen Kingdom really feels like two films hastily put together. It is split right in the middle into an hour-long disaster film that could have served as the perfect end to this franchise, followed by an hour-long gothic horror tale meant to revive the franchise in a few years with a series of twists so incredible and bizarre I would buy a ticket to the next one right now if I could. This is a movie that will heavily polarize audiences, but those willing to stick along will get one hell of a crazy ride.